Seahorses. Yellow-head jawfish. Fairy basslets. Juvenile angelfish. Cleaner wrasse. Baby parrotfish.What has turned up in the seemingly bottomless stomachs of lionfish in seas where they do not belong could more than fill both sides of a Caribbean fish identification card. In other words, everything. 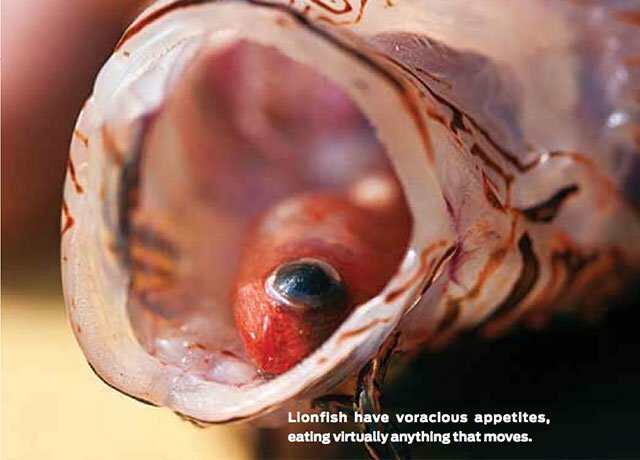 Invasive lionfish are a threat not only because of their voracious appetite but also because of their prolific breeding — in one month, a single lionfish can lay 30,000 eggs; in three months, 8.1 quintillion.